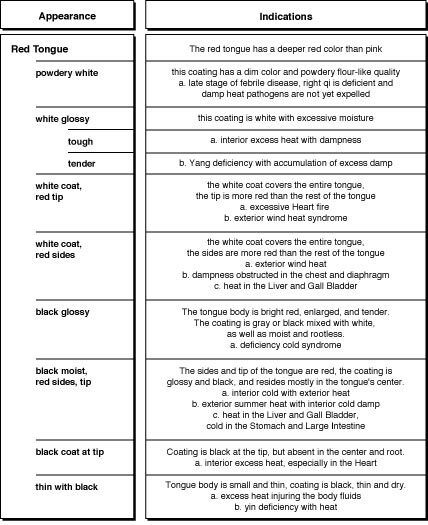 Indications of coating variations of the red tongue body. thin with black Tongue body is small and thin, coating is black, thin and dry. black coat at tip Coating is black at the tip, but absent in the center and root. red sides, tip The sides and tip of the tongue are red, the coating isglossy and black, and resides mostly in the tongue’s center. black glossy The tongue body is bright red, enlarged, and tender. as well as moist and rootless.